We provide a nutritious lunch prepared daily on site by our cook as well as healthy snacks for morning and afternoon tea. Our menu is vegetarian and meals are made from fresh ingredients locally sourced where possible; bread from a local bakery and fruit and vegetables grown in the area. We aim to ensure that all meals are healthy and offer children a diverse range of interesting foods based on flavour, taste and texture. We promote and encourage positive eating habits and educators sit down to eat with the children, sharing food and conversation. Our kitchen is audited annually by an independent auditor and inspected by the Mount Alexander Shire Council Health Department. Our menus are evaluated against the Healthy Eating Advisory Service Food Checker to ensure that our menu supplies at least 50% of a child’s daily nutritional requirement. 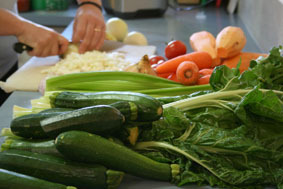 We are experienced in providing food for those with food allergies and intolerances. We work with families to determine each child’s needs and to develop a nutrition plan that ensures a balanced diet while keeping the child safe. Anaphylaxis: As peanuts in particular are one of the major triggers for anaphylaxis, our centre has a nut-free policy. We ask parents not to bring any nut-based foods or snacks into the centre and to wash children’s hands if they have eaten nuts for breakfast or leading up to their arrival. Spicy Tomato and Lentil Soup. An Autumn favourite. Fry onions, stock powder and all spices in oil until soft. Add vegetables (except for peas) and sweat until softer. You may need to add water. Add and water, bring to the boil. Just before serving stir in chopped coriander.